My brother-in-law got the mail yesterday, so it was at his house. It turned out beautiful. You do terrific work. It will be a Christmas present for another relative. It's name is "What's Your Favorite Color?". 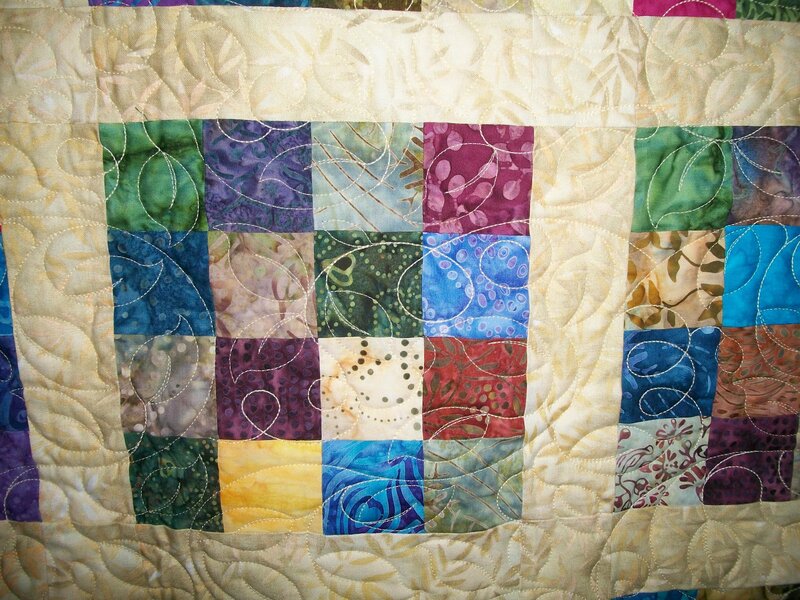 Beautiful quilt and terrific quilting. Love what you named your quilt too. Great fabrics too. Very nice quilt. Did you start with a jelly roll? Very colorful quilt. Quilting enhances the quilt quietly. Good job for both of you. I like everything about that beautiful quilt! Does that pattern have a name or did you design it out yourself? I think I would love to make one of those with my scrap stash. Looks like it's totally batiks but it would still work with regular fabrics. Pretty quilt! You two make a great team. Great use of your colors! Beautiful! I love it! It would be the one of a very few that I would keep forever with me!! Wonderful finish...it will be a great gift. Lovely quilting and Harriet does beautiful work. Beautiful quilt. I'm sure the person it's meant for will love it!! Beautiful quilt, simple but elegant. I especially like the beige you chose for the sashings and borders. I adds a warmth that wouldn't be evident with black or white. The quilting is very complementary. Great finish. Really like your quilt. I love scrappy squares. What a great stash buster. Will use my Accuquilt to cut the fabric! What a nice scrappy! Quilting is great. Beautiful! It will make a wonderful gift. Rich in jewel colors. You've created a gem! It is a quilt my husband and I would both like. 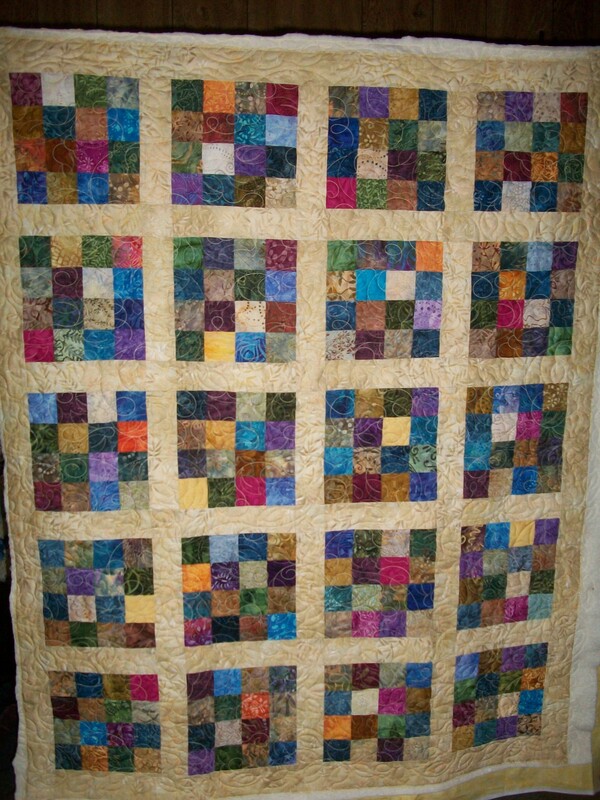 The colors are fabulous and the quilting fantastic. Great teamwork!